A. Arre.st is your fair use public records news reporting and research resource. Arre.st contains public arrest records of private individuals that are of interest to the public. Q. Is everyone listed here guilty of a charge? A. No. All persons are presumed innocent until proven guilty in a court of law. Q. I was acquitted, falsely accused, had my ID stolen, found not guilty or my record was expunged. Will you remove the booking data? A. No. All data is collected from official sources and considered to be public record at the time of publishing. Q. Isn’t this violating my rights? A. No. Arre.st is ran by a registered news syndicate and posting public records is a practice protected by the First Amendment to the United States Constitution. Q. Will threat of a lawsuit or complaints filed with the Attorney General or BBB help get data removed? A. No. These avenues will essentially slow any processing and potentially create additional publicly available records. Q. Is it free to view the mug shots? A. Yes. 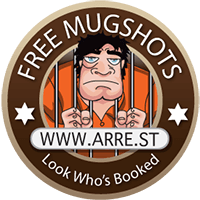 It is 100% free of charge to view our data based mug shots and booking info. Q. Do you plan on requiring users to register? A. No. The public is free to peruse the mug shot database without registering. Q. I know someone was arrested, but I don't see the record on arre.st. Why not? A. While we strive to gather complete data from every source, around 1,000 counties and counting, sometimes it's not possible. Q. Is the Arre.st network of web sites ran by a government agency? A. No. We are not affiliated with any local, state or federal government agency. Q. Why is there no date or an incorrect date? A. Date may not have been available or it may be the date arrested, booked, or databased. It is also possible for various date formats to be displayed. I.E m/d/y d/m/y. Q. Are you violating copyright law posting these images? A. No. According to Federal Law copyright does not prohibit the reproduction of public records. Q. Did you start the website to collect licensing fees? A. No. The local regional jail website was too tedious to use. The only other option to view mugshots was a print publication that was being sold. To bridge the gap and provide free and easy to view mugshots ClarksburgLeak.com was created in early 2009. This original iteration of our public database interface had no licensing option. A licensing option was highly requested. Q. Will you, the arre.st admin, delete a record from the arre.st website? A. Only with a valid court order specifying the URL. Q. How do I license a record and delete it myself? A. Click through to the booking record and if present click the "Delete This Record" button to initiate the process. Not available to residents of CA, OH, OR, SC, or outside of the United States. Void where prohibited by law. Q. I have a license key. Where do I enter it? You may verify the ID is correct by clicking on the content ID hyperlink within the licensing form. Q. I have a legal document that I need to send to you. Where do I send it? A. Send all legal documents to our registered agent for processing. Q. I have a comment/question/complaint. How can I contact you? A. Please visit USSupportLLC.com for support.